In 1904 the first airbase in Italy was founded on the edge of Lake Bracciano in the village of Vigna di Valle. Now, over 110 years later, the former airship and seaplane base is now the home of the Italian Air Force Museum – Museo Storico Aeronautica Militare. Adam Duffield ventured out to explore the fascinating collection. Situated a short 30 minute drive from the outskirts of Rome, the Italian Airforce Museum’s location on the edge of the Lake Bracciano must make it one of the most picturesque locations for an air museum around. With the water lapping up against the former seaplane docks, the museum is housed upon part of the site of the former Vigna di Valle airbase which, whilst still a military facility, is no longer an active flying base and houses the Air Force Sports Centre along with the Centre for Meteorological Experimentation. The museum opened in May 1977 after being forced to move from its previous location in Turin. Comprising four hangars that formed part of the original airbase, the walk from the car park to the museum entrance takes you past a number of memorial statues and three externally displayed aircraft before entering and starting the main visit. Being the museum of the Italian Air Force, it is dedicated to showing the history of Italian aviation and related stories from the early days right up to current times. After going past the small shop, the visit starts at Hangar Troster – a building that dates back to the First World War and appropriately holds aircraft of a similar era. Alongside the aircraft themselves, there is a considerable amount of memorabilia displayed in amongst them such as paintings, models and engine sections. A corridor leads the visitor through the second display area, Hangar Velo, which covers the interwar period of aviation. On entry, the most immediately visible area is a display section dedicated to Italo Balbo, Minister of the Air Force from 1929 until late 1933. In December 1930, Balbo led the first massed formation of aircraft, 12 Savoia-Marchetti S.55 flying boats, from Italy to Brazil as part of an exercise on massed formation navigation. Not content with a formation of 12, Balbo led a second flight of 24 later model S.55s from Rome to Chicago. Two large display cases present models of both formations along with artefacts and information boards. The remainder of the hangar contains a number of racing seaplanes built for racing in the Schneider Trophy, and interwar fighters. Hangar Badoni is directly connected and houses a collection of second world war examples including some of the largest aircraft in the museum. Originally built in the 30s and used as a seaplane maintenance hangar, the full height windowed doors give a wonderful view out onto both the lake and a crane once used to remove the aircraft from the water. An elevated walkway lined with portraits of Italian fighter aces provides a good view over the entire hangar along with a link into the next area. Bringing the history of the air force up to current times, Hangar Skema is a relatively recent expansion to the museum when compared to the other buildings. Starting with post World War Two aircraft, the majority of the area – the largest hangar of the museum – covers a wide variety of fighter jet types. A walkway running along one length of the building gives commanding views over a number of the exhibits. Dominating Hangar Troster is a Caproni Ca.3 (23174) bomber with an unusual 3 engine design and rear facing gun position – a cage between the twin boom tail. The Lohner L-1 seaplane is another large display in this area and the only aircraft in foreign air force markings representing its capture by two Italian pilots. Around the sides of the hangar other aircraft include a Macchi Hanriot HD.1, another Spad S.VII example flown by ace Fulco Ruffo di Calabria and an Ansaldo AC.2 (MM1208). Alongside the Schneider cup winning aircraft, three other cup racers reside in Hangar Velo – Macchi M.67 (MM105), Macchi Castoldi MC.72 (MM181) and Fiat C.29 (MM130). The interwar aircraft include two Industrie Meccaniche e Aeronautiche Meridionali (IMAM) examples – a Ro-37bis Lince (MM11341) and Ro-43 Maggiolino (MM27050) – a Fiat CR.42 (MM5643), Hispano HA-132 (C1-328) and a Caproni Ca-100 (I-GTAB). Housing the largest examples on display at the museum, Hangar Badoni’s smaller fighters are dwarfed by triple engined aircraft including the Savoia-Marchetti SM-82PW Canguru (MM61187), SM-79 Sparviero (MM24327) and Fiat G-212AV (MM61804). Amongst the various smaller aircraft the same Italian manufacturers appear with Fiat represented by a G-46 (MM53286) and G-55, Macchi with a MC-200 Saetta (MM5311) and MC-205 Veltra (MM9546). A Supermarine Spitfire Mk9 (MK805) is also present representing one of the smaller numbers of foreign aircraft operated during the timeframe. Unlike the majority of the museums collection, the aircraft on display in Hangar Skema shows the success the American aviation industry had in jet aircraft design compared to the Italians and a number of American types that were used in service are shown. The Canadian license built Canadair CL.13 (MM19792), a pair of Republic aircraft in the form of F-84F Thunderstreak (MM536892) and F-84G Thunderjet (MM111049), North American F-86K Sabre (MM554868), Lockheed RT-33A Shooting Star (MM535594) in a bright target tug scheme and Lockheed F-104G Starfighter (MM6501) represent a large proportion of the collection. The American influence on the Italian forces aircraft selection is also represented by the Grumman S-2F Tracker (MM136556) that was used in the Anti-Submarine Warfare role. There are still however a large number of Italian produced machines on display. Italian aircraft manufacturer Aerfer worked on designs for jet fighters during the early 50s and two of the prototypes are on display in the museum. The Sagittario II ‘Ram’ (MM561) was a development of the Ambrosini Sagittario and became the first Italian designed and built aircraft to break the sound barrier. The design was followed by the Ariete (MM569) however neither type made it to production. Fiat are well represented with a number of G-91 examples – the G-91T (MM6344) trainer, G-91PAN (MM6250) in Frecce Tricolori scheme and G-91R (MM6280) which has one side cutaway to view the internal structure. An Aermacchi MB-326E (MM54389) and MB-339A (MM54485) also in Frecce Tricolori scheme round out the Italian jets. Other aircraft in Hangar Skema include a trio of prop trainers – Aermachhi MB323 (MM554), North American T-6G (MM54097) and the more recent SIAI Marchetti SF.260 (MM54436) – and the museums only rotary aircraft in the form of Agusta Bell AB-47G (MM80113), AB-47J (MM80187) and AB-204B (MM80357) along with Agusta Sikorsky SH-3D (MM80973) which was frequently used by the Pope in the VIP transport role. With such a range of exhibits dedicated to showing the history of the airforce its not surprising that a number of airframes have some interesting history behind their service careers. 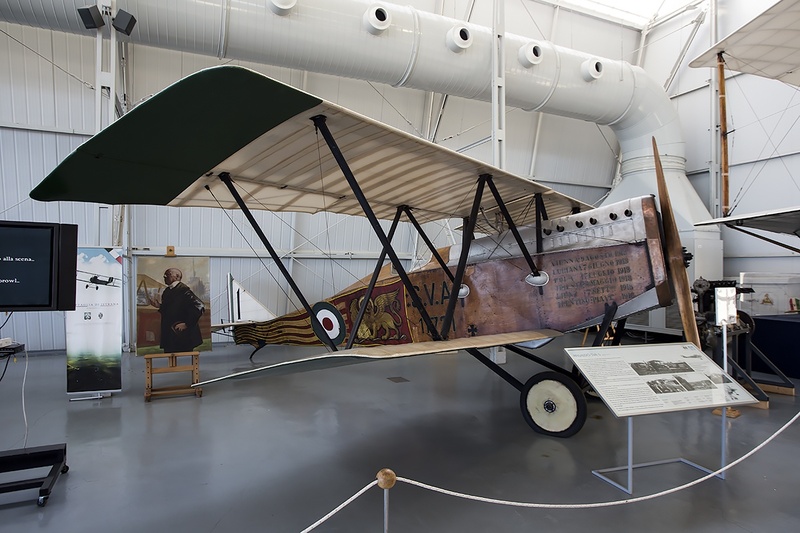 Ansaldo SVA-5 – This biplane was designed for reconnaissance activity during World War One with the model on display being an example of the most numerous built of the type. On 9th August 1918 it was a flight of 11 Ansaldo SVAs that performed the propoganda leaflet drop over Vienna which included the very aircraft on display. It was two SVAs that also performed the first flight from Europe to Japan in 1920. Caproni Campini CC.1 – MM488 – One of the worlds first jet engined aircraft, the CC.1 was infact powered by a hybrid that used a conventional piston engine (without propeller in this design) to drive a jet compressor. Taking to the skies in August 1940, just two prototype aircraft were built and MM488 is the sole remaining example. Spad S.VII – World War 1 was a significant milestone for military aviation and the Spad S.VII was a very successful French designed fighter. Used by a number of allied air forces, it was the platform of choice for numerous Aces. This particular aircraft was flown by Italian ace Ernesto Cabruna who is credited with a total of eight aerial victories – 7 against other aircraft and 1 against an observation balloon – and the battle scars of these encounters are still present on the aircraft. CRDA Cant Z.506S Airone – MM45425 – Originally designed as a triple-engined transport aircraft in the mid-30s, it soon became a record beater by claiming numerous records for speed, height and distance relative to its class. With the war starting, the type was pressed into service in reconnaissance and torpedo bomber roles prior to being extended to the SAR role, as shown by the variant on display. Macchi M.39 – MM76 – One of a number of Schnieder cup entrants on display, this airframe was the winner of the 1926 race at the hands of Major Mario De Bernadi and was the last Italian winner. The aircraft was designed by Mario Castoldi who was the designer of the M.39 along with a number of entrants to both previous and subsequent events before moving on to designing World War 2 fighters. Macchi Castoldi MC.202 Fulgore – MM9667 – Another aircraft designed by Mario Castoldi and developed from the MC.200, the MC.202 became one of the most prominent Italian fighters. Powered by an Alfa Romeo built license copy of a Daimler-Benz engine, MM9667 is painted as the aircraft flown by Italian ace Giulio Reiner who was one of the first pilots to break 1000km in a dive in a MC.202. Aermacchi MB-326E – MM54389 – Used in the Italian Air Force as a primary jet trainer, it replaced the American designed T-6 Texan. When entering service the MB326 restored an all Italian designed training aircraft fleet, and the aircraft displayed was one of the last to be delivered. Receiving significant export success – including in use as a light attack platform – it was eventually replaced by the Aermacchi MB-339 which still remains in service. AMX International AMX MM7125 – Still in service with the Italian Air Force, this airframe serves to evidence just how far Italian aviation has come. Designed as a joint venture with Brazil by a trio of companies – Aeritalia, Aermacchi and Embraer – it first entered service in 1989 and is used in both ground attack and reconnaissance roles. Don’t let the fact that the museum is almost all housed within hangars put you off if you are only attending to get a photographic record of the visit. Both Hangar Troster and Badoni provide some excellent natural lighting – with high windows all around the first, and the large hangar doors of the second allowing in some tremendous levels of light on a good day.. However the remaining two hangars are mostly devoid of significant amounts of natural light, instead relying on a few ceiling lights and are therefore noticeably darker. This makes conditions trickier but nothing that a higher ISO setting can’t cope with. However, in both hangars, clean shots of aircraft are difficult to obtain. The museum has a massive collection of items from paints to uniforms that are displayed around the aircraft along with large information boards for each type that can be difficult to avoid creating into shot. Proximity of the aircraft to each other is also tight but to be expected with the limited space available in many museums. Whilst there is nothing to specifically say that tripods aren’t permitted there are however some tighter rules regarding back packs that may trip those used to British museums. Like a number of attractions in Rome, taking backpacks into the museum is generally not permitted and this includes camera bags, even smaller ones. While the author was not queried regarding a camera backpack on this visit, it is something to be very aware of ‘just in case’. With a layout designed to walk you through the history of Italian aviation as you go, the whole musuem is a showcase of some of the fine machines and manufacturers that have graced the countries skies over the last 100 years along with representing the importance that they played not only during periods of conflict but also during peacetime. The military aviation industry of the 21st Century may have consigned some of the names to the history books, as they either went out of business or merged with others to ensure their longer term survival, but their legacy still lives on in this incredible collection of aircraft dedicated to the country’s air force. The Museo Storico Aeronautica Militare is most definitely worth a visit for anyone planning to be in the Rome area.